Rigid stems, up to 1.8m, grows in clumps. 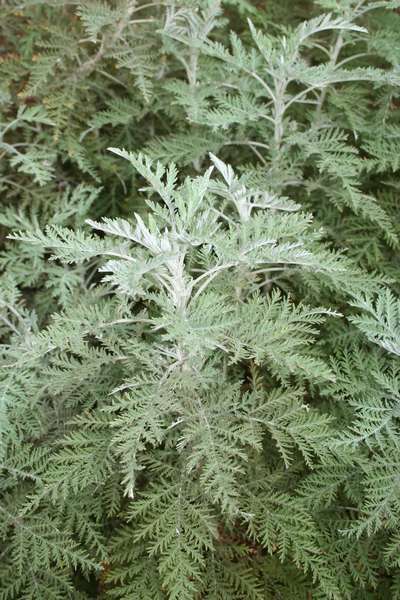 Leaves - soft, dark green, covered in whitish bristles. Blossoms in late summer - bracts of inconspicuous, butter-colored flowers. Deciduous. Full sun. Drought tolerant. Prune at the end of winter to encourage new growth in spring. Enemas, poultices, vapor, infusions, body washes, lotions, smoked, snuffed or drunk as a tea. Bitter taste. Blood purifier - acne and boils. Colds, headaches, coughs, fever, earache, malaria, diabetes meilitus, intestinal parasites, stomach disorders, loss of appetite, colic. Insert fresh leaves into the nostrils to clear blocked nasal passages and place leaves in socks for sweaty feet. Anti-inflammatory, antidepressant, pain-relieving - wormwood dressing of hot leaves bound over sprains, arthritic and rheumatic swellings. Tea - disinfect cuts and grazes. Dried powdered wormwood deters ants.